a building intended primarily for performances by singers. The first odeum, designed by Ictinus, was built by Pericles at the Acropolis in Athens in 440 B.C. 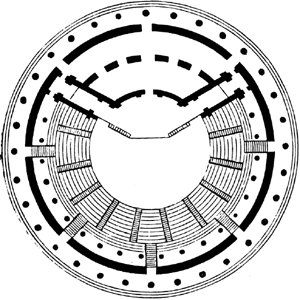 Usually round, odeums were frequently enclosed within a square, roofed building. In Rome an open type of odeum was common. Broneer, O. The Odeum. [Cambridge, Mass.] 1932. The original Odeon Cinema opened in Perry Barr on August 4, 1930. Where Oscar Deutsch is buried in the Hebrew section of Witton Cemetery, he can see the Odeon from his grave,' said Steve Tovey, who lives in Cannock and was the last Odeon cinema organist until the Odeon New Street in Birmingham went multiscreen in 1987. The frontage of the original Odeon is very different today. It was the boardroom of Odeon cinemas until 1935 and there is a little flat Oscar used before he moved to Augustus Road. The name odeon was a simplified version of the Greek word for Odeon. In the book Odeon Cinemas - 1: OscarDeutsch Entertains Our Nation published last year, Allen Eyles recalls how Deutsch's business associate Mel Mindelsohn suggested the title for Perry Barr after he had spotted the dignified, unusual name on a building in Tunis. It was only later with the success of the Odeon enterprise that the letters were translated into the phrase 'Oscar Deutsch Entertains Our Nation. The public may have largely forgotten the name Oscar Deutsch but Rob Wood, design services manager for Odeon Ltd, pays an effusive tribute to the man from Birmingham and his humanity.